Marilyn Mosby, Baltimore state’s attorney, filed charges ranging from misconduct in office to “depraved heart” murder against six officers for the death of Freddie Gray who suffered a fatal spinal injury. One hung jury and three acquittals later, the remaining charges were dropped. In April of 2015, Freddie Carlos Gray Jr., a 25-year-old black man, broke his neck while in police custody in Baltimore. The medical examiner ruled Gray’s death a homicide, but no officer was convicted of a crime. Some people see in the trial outcomes proof of systemic bias against black people. Others see proof of a black prosecutor’s bias against police officers. While either or both viewpoints may be valid, the Gray trials prove neither. The verdicts reflect the inability of forensic medicine to answer critical questions. 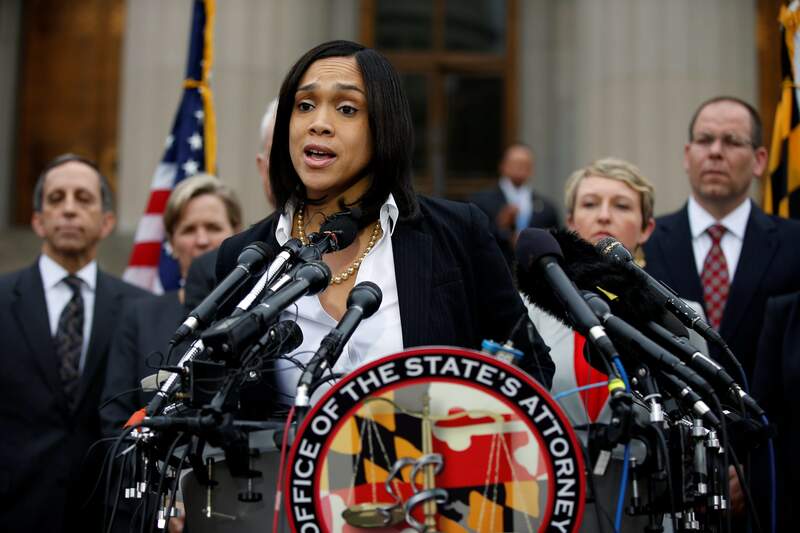 Baltimore State’s Attorney Marilyn Mosby said she would “work to deliver justice on behalf of Freddie Gray.” After the homicide ruling was released, Mosby filed charges ranging from misconduct in office to “depraved heart” murder against six officers. One hung jury and three acquittals later, the remaining charges were dropped. Brown is correct that no proof of the time, place and mechanism of Gray’s injury was presented. That’s because there is no proof. According to The Baltimore Sun, Gray fled when he spotted patrolling police officers. When initially apprehended (quietly gave himself up, police said; excessive force was used, bystanders said), Gray asked for an inhaler. The officers didn’t call for a medic. They put Gray in the back of a transport van. He wasn’t seat-belted, in violation of policy. The van stopped several times, once to apply restraints because Gray was yelling and rocking the van. At a fourth stop, 18 minutes into the ride, Gray was face down on the floor. He said he couldn’t breathe or get up and needed a medic. Medics weren’t summoned. Gray was assisted to a bench, and the van stopped again to pick up another detainee. By that time, Gray was slumped against the bench, lethargic and barely responsive. At district headquarters, he wasn’t breathing. Gray was resuscitated, and hospital doctors found displaced spinal fractures in his neck that pinched his spinal cord and impaired his ability to breathe. Gray died a week later without regaining consciousness. A Baltimore medical examiner confirmed the neck injuries. She found a bruise on the back of Gray’s head, scrapes on his temples and left cheek, wrist and ankle scrapes from the restraints, a very faint bruise on his back and another on his right side. Media reports said Gray’s voice box was “crushed,” but he had no such injury. In her opinion, the medical examiner said Gray’s was a “high energy injury … such as seen in shallow water diving incidents.” She thought it unlikely that sliding back and forth on the floor of the van could produce enough force. It was more likely that Gray got partially to his feet and struck his head when he was pitched headlong against something during a stop or turn. Gray was fatally injured in custody. A seat belt was available but wasn’t used, and prompt medical attention wasn’t sought. Therefore, the medical examiner concluded that Gray died through “acts of omission” and that the manner of death was homicide. A medical examiner’s homicide certification doesn’t prove a crime. The Gray ruling is a reasonable though debatable judgment about an administrative classification. I favor undetermined, though the opinion of the Baltimore medical examiner is certainly defensible. I don’t think the failure to summon a medic warrants a homicide certification. Medically untrained cops aren’t equipped to recognize the early signs of a highly unusual injury. To certify Gray’s death a homicide, I’d have to conclude either that his injury was inflicted by someone or that he was negligently placed in a position so dangerous that death was predictable. I don’t think the failure to seat-belt Gray made it predictable that he would die. In one of the trial verdicts, Judge Williams said that the failure to seat-belt Gray “may have been a mistake and may have been bad judgment,” but it wasn’t a crime. Prosecutors theorized that Gray was injured because he was intentionally given a “rough ride” in the van. But nobody reported erratic or high speed driving. And if Gray were violently thrown around in the van, he would have had many more bruises than the medical examiner found. Death from a “rough ride” is speculation without foundation. Any attempt to prove that a specific person or persons inflicted Gray’s injury would require evidence of when the injury occurred. Was he slammed against something when he was apprehended? When his ankles were restrained? At the stop where he was “found” face down? No test or observation can pinpoint time of injury precisely enough to confirm or refute any of these possibilities. According to the medical examiner’s report, Gray’s spinal fractures were “very unstable” – meaning the bones could shift easily. This suggests that an initial, less severe injury might have been worsened by subsequent movement or manipulation. Occasionally, a walking, talking accident victim is found to have an unstable spinal fracture. That’s why medics often apply neck-stabilizing collars before transport. So it’s possible, though not provable, that Gray’s spine was broken but not displaced during his initial apprehension. If so, Gray’s own movements during the van ride or manipulation during the placement of restraints could have caused the broken bones to shift and pinch his spinal cord. I think it’s possible that Gray’s injury was inflicted. It’s also possible that his neck was broken when he was propelled against some part of the van. Because medical science is limited, all opinions about when and how Gray’s injuries occurred are speculative. And as Judge Williams indicated, speculation is inadequate for a criminal conviction. When forensic medicine can’t provide definitive evidence, failure to convict doesn’t prove bias. And a “not guilty” verdict doesn’t prove innocence.